Mothering Sunday, this year falling on Sunday March 31, marks an annual highlight to treat our superhero mums to something they really love. It’s an extra special day where we can pull out the stops and spoil them rotten. Whilst flowers, chocolates or pampering treatments are commonly opted for when selecting what to give or do, they can often become repetitive. So this year, why not think of something slightly different? Mother’s Day is a centuries’ old tradition to celebrate mothers, with children expressing their love in various ways. And we certainly know how to treat our favourite ladies; it’s estimated that in 2018, us Brits spent a whopping £600 million on Mother’s Day gifts*. If you’re tired of buying the same items year after year, ensuring you find the right present can be trickier than it seems, especially for mum’s who are impossible to buy for. But rather than worrying about what to buy, why not indulge her to a unique gift that she can treasure forever? Enter the personalised gift. Both thoughtful and original, you don’t have to spend a lot to go a long way but it will guarantee to melt mum’s heart. Leading high street retailer Ryman Stationery has a wonderful array of goodies and ideas to help inspire you this Mother’s Day and understand the value of keeping present personal. Mark Mother’s Day in your diaries and get set to create a magical present, which will always remind her of you. You can’t put a price on beautiful moments spent together. Perfect for storing photographs, cards, favourite recipes or even for planning a memorable event, scrapbooks are a beautiful way to create and preserve memories with mum. Why not fill one for her and present it completed for her to admire and enjoy? Or sit down and fill one together, making memories as you go? Give her a keepsake to keep hold of, forever. For a scrapbook on the go, this Silvine Marble Scrapbook Assorted 40 Pages (£1.99) is ideal for popping in a handbag, so that keepsakes can be safely collected and stored whilst out and about. Perfect for busy mums on the go. Make an impact this Mother’s Day with the striking Craft Box Gold Chevron Scrapbook Album 8 X 8 (£6.99). With 40 pages and wonderfully thick 240gsm paper, it’s a gorgeous blank canvas to begin storing all of mum’s precious memories and keep a log of happy occasions. For a modern twist on creating special moments, look no further than the ingenious HP Sprocket 200 Photo Printer Luna Pearl White (£119.99). Print magical memories on the go straight from your mobile and personalise images with text, emojis and special effects, ready to add to mum’s scrapbook. To create the wow factor and create special memories together, the Scrapbooking Bundle Flowers (£24.99) is a wonderful gift to bestow on mum and begin a scrapbook from scratch, to enjoy together. Including a wild flowers paper pad filled with various designs, a scrapbook album and a glue pen, there’s no limit to what you and your mum can create. All that’s left to do is fill with your most precious moments. 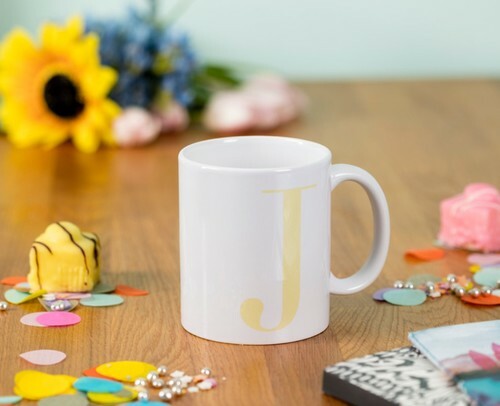 Nothing says how much mum means to you, quite like a personalised gift, so keep her presents as unique and exclusive as she is to you. Whatever you choose to give her this Mother’s Day, make sure it’s something to reflect her best. Afterall, what could be more individual than your mum? Give her an adorable keepsake this Mother’s Day with the Ryman Personalised M is for Mummy Mug (£8.99). Add her initial and name to the back of the mug so that she’ll always have a reminder of how much she’s appreciated. Sometimes words aren’t enough but all that will change with this gorgeous Ryman Personalised Mounted Frame To The Moon and Back (£15.99). Add your mummy’s name and express just how much she means to you. Hung on the wall, Mum will remember your love every day, 365 days a year. For non-stop mum’s who run a busy household, there’s nothing quite like being organised. Help the matriarch of your home stay on top of things with this gorgeous Ryman Personalised Soft Cover Medium Notebook The Journal in Copper Foil (£14.99). This would look gorgeous displayed on her hallway or kitchen table and whilst keeping track of family lists, events and to-dos, she’ll be constantly reminded of you. For the icing on the cake, why not present your presents with that extra bit of oomph and indulge her with a Personalised Luxury Large White Gift Bag with Gold Foil (£6.99)? Make her gifts stand out from the crowd and personalise, so mum is guaranteed an extra special surprise. 6. Watch her unwrap a perfect, personalised present and make their Mother’s Day extra special. Three cheers, for mum. This press release was distributed by ResponseSource Press Release Wire on behalf of Ryman Stationery in the following categories: Children & Teenagers, Men's Interest, Entertainment & Arts, Leisure & Hobbies, Home & Garden, Women's Interest & Beauty, Food & Drink, Media & Marketing, Retail & Fashion, for more information visit https://pressreleasewire.responsesource.com/about.